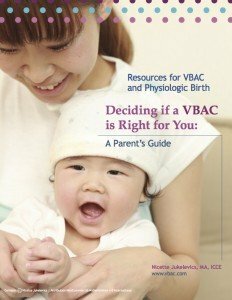 The VBAC Education Project, endorsed by the International Childbirth Education Association and the International Cesarean Awareness Network, was developed to empower women to make their own decisions about how they want to give birth after a cesarean and to provide VBAC-friendly birth professionals and caregivers with the tools and resources to support them. The National Institutes of Health and the American College of Obstetricians and Gynecologists encourage healthy pregnant mothers with a prior cesarean to labor for a vaginal birth after a cesarean (VBAC), yet most mothers have a routine repeat cesarean. Often they don’t have access to accurate information about VBAC and cannot make an informed choice, or they can’t find a care provider or hospital to support them. Between 70-75% of mothers who labor after a prior cesarean have a safe VBAC, but only 10% of women had a VBAC in 2012 compared to almost 30% in 1996. Routine repeat cesareans put healthy mothers and babies at risk for several short- and long-term health complications. Women should have access to evidence-based information and to safe care if they choose to labor for a VBAC. If you had a baby by cesarean, you have a choice about how you want to give birth this time. It’s your decision. The Parent’s Guide slide-set is divided into 14 modules. You can read all the modules or just the ones you are most interested in. 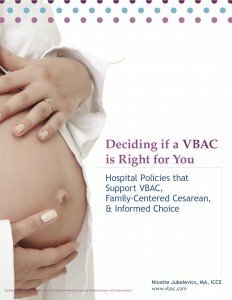 This evidence-based guide provides comprehensive information on VBAC, a safe option to a routine repeat cesarean. It includes information on how to increase your odds for a VBAC and how to find a supportive caregiver and place of birth. It also helps you understand why you may have had a cesarean and how you can do things differently this time. Here is the information that you will find in the slide-set. Module 2: What Is the Main Concern When Laboring for a VBAC? Module 4: What Are the Odds of My Having a VBAC? Module 11: Planning a Home VBAC (HBAC): Is It Safe? The Resources for VBAC & Physiologic Birth helps expand your knowledge about VBAC and physiologic (normal) birth. Respecting the process of normal birth and introducing interventions only when necessary increases the chances of having a safe vaginal birth. The Educational Handouts for Parents helps you think about what you want for your birth and to discuss the issues that are important to you with your caregiver. It gives you the tools you need to make informed decisions and increases your chances of having a safe and satisfying birth. The slide-set, Deciding if VBAC Is Right for You, was also developed to be used as curriculum for VBAC classes. If you teach childbirth classes or lead a support group for women with a prior cesarean, you can choose any of the 14 modules that meet your needs and combine them to best serve the expectant parents you work with. The supporting e-book, VBAC for Educators: A Teaching Guide helps you to present the material to your students. It includes background materials for each of the 14 modules, teaching tips, and sample informed consent/refusal forms, parent education, and hospital protocols for VBAC that you can copy for your use. The Resources and Educational Handouts can reinforce the topics you have already covered. 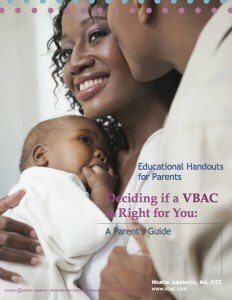 If you are a labor and delivery nurse,office nurse, doula, community-based maternal-child health worker or birth activist, the Deciding if VBAC Is Right for You slide-set provides the medical facts you need to understand the VBAC option and the psychological issues related to laboring for a VBAC. It also includes the many ways you can support and empower mothers to make their own best decisions about how they want to give birth this time. The Resources and Educational Handouts for Parents mentioned above is useful for you and the families you work with. 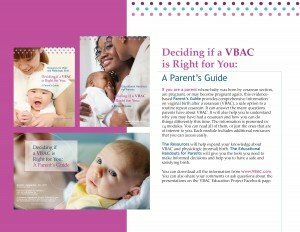 If you are a physician or midwife, the slide-set provides expectant parents with evidence-based information about VBAC. It can help your patients to reinforce and expand the prenatal conversations you will have with them. It also helps mothers prepare for childbirth and clarify some of the issues they are most concerned about. 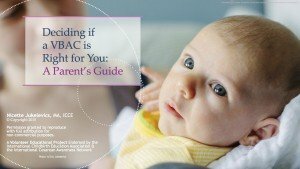 If you would like to find out more about how other providers and hospitals are supporting VBAC, you can download sample hospital VBAC and gentle-cesarean protocols, informed consent/refusal forms, and patient education materials from, Hospital Policies that Support VBAC, Family-Centered Cesarean, and Informed Choice. The flyer is designed to advertise the availability of the VBAC Education Project. It can be distributed to expectant parents, advertise a class, or a community support group meeting. There is space available to print the name of your birth practice, hospital, birth center or educator, doula and breastfeeding support practice. Live links are embedded to give readers direct access to additional resources. Because we have no control over the management of these websites, specific links may have been moved, relocated or removed as information is updated. If the link doesn’t direct to what you’re looking for, try using the search function on that specific website. Share with your friends and colleagues how you are using the VBAC Education Project to educate parents and bring about change in your community to increase access to safe care for VBAC.